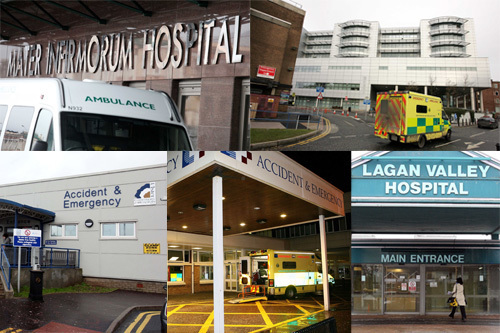 Over 170 people died in health and social care linked serious adverse incidents in Northern Ireland in the 14 months up to the start of July, The Detail can reveal. However, reports by health authorities containing information about the 82 deaths so far this year indicate that 26 of them may not have been reported to the Coroner’s Office, which is supposed to be informed of sudden, unnatural or violent deaths. The Serious Adverse Incident (SAI) reports along with the figures have been released to The Detail following Freedom of Information requests to the Health and Social Care Board and the Department of Health. The reports have been heavily redacted to remove the location, timing and context of the incident – and sometimes the response of the authorities. The HSCB says this is to protect patient confidentiality. However, the information which is visible reflects that the deaths reported this year include suicides, deaths in hospitals, the death of “clients” discharged after failing to attend appointments and people who died following surgery. Just this week a new SAI report was submitted after a former patient of the South Eastern Health and Social Care Trust and her husband were found dead in a burnt-out car outside Ravernet on Sunday. It is understood the woman was receiving inpatient and outpatient psychiatric care from the trust. An ‘adverse incident’ is defined as “any event or circumstances that could have or did lead to harm, loss or damage to people, property, environment or reputation”. Reports can be submitted by staff working in hospitals, community/social care and family practitioner services. This information is not routinely made public. There has been a requirement from July 2004 to report serious adverse incidents within the healthcare system. These incidents are those serious enough to require regional action to improve safety, or be of major public concern or require an independent review. The aim is to investigate and for action to be taken to reduce the risk of reoccurrence. Figures we requested show that a total of 1,868 SAIs were reported by health and social care organisations to the department and HSCB between the start of January 2005 and the beginning of July this year. Before May 1st 2010 and the restructuring of the health system, serious adverse incident report forms were sent to the Department of Health. The Health and Social Care Board (HSCB) received a total of 316 SAI reports between the start of May last year and July 3 this year, of which 174 involved the death of a person. This does not necessarily mean that the serious incident led to the death. The figures we are reporting today do not include the less serious ‘adverse incidents’ or ‘near misses’ which are also reported to the health trusts. We requested copies of SAI report forms held by the HSCB and the Department of Health. The HSCB sent us copies of the 82 reports which cover all of the deaths reported to the board since the start of 2011. A black marker has been used to remove information from each form – making each one difficult to read. However, it is still clear that many of the deaths involved people already in contact with health services. The documents do not contain the names of patients, staff or any hospitals involved. They have been heavily redacted before being released to remove any reference to gender (for example the words he/she), age, cause of death, conditions or illness patients were suffering from and even which SAI category their case falls into. The Department of Health took a different view of our request and refused to release copies of any of its SAI reports (which cover the period January 2005 to end of April 2010). We have requested an internal review of this decision. Of the 82 SAI reports received by The Detail, only 56 of the forms confirmed that the coroner had been notified of the death. Each form contains a section entitled ‘other organisations informed’. It lists eight organisations, including the PSNI and coroner, and space to write what date they were informed. In 26 reports the space relating to the coroner is blank. The Regulation and Quality Improvement Authority (RQIA) was informed of 61 of the deaths, the forms show. Incidents which appear not to have been reported to the coroner include a suicide, someone who died in hospital after surgery, a young person found dead in their bed, the suicide of a “client” (who appears to have been receiving help with mental health issues), the deaths of a number of people already using services and a death following a procedure (even though device manufacturers were informed after the death about the device used). It is possible that the coroner was informed about some of the deaths at a later date but if the deceased person had already been buried or cremated, the coroner’s investigation would be limited and the possibility of having a post-mortem examination could also have been lost. We asked the Coroner’s Office to comment on the figures. A spokeswoman stressed that the coroner should investigate the circumstances of all sudden, unnatural or violent deaths. She also said that a referral to the coroner may have been made at a later date. However, the spokeswoman did confirm in response to a further query from us that failure to report a death has happened “on very rare occasions” in Northern Ireland but added that the circumstances of these cases did not warrant referral to either the police or a professional body. Action against Medical Accidents (AvMA) is a London-based independent charity which promotes patient safety and justice for people affected by a medical accident. Its deputy chief executive Hugh Williams warned against the assumption that someone else is investigating or responsible when things go wrong. He told The Detail: "If a mistake has been made, patients or their next of kin have a right to know what happened and why. He continued: "Robust systems for reporting and investigating medical accidents are essential. A common failure underlying patient safety issues is the mistaken expectation somebody else is investigating, somebody else is responsible. “AvMA is campaigning for there to be a legal duty of candour. A National Audit Office report in 2005 revealed that only 24% of NHS trusts routinely informed patients of a patient safety incident and, astonishingly, 6% admitted to never informing patients. 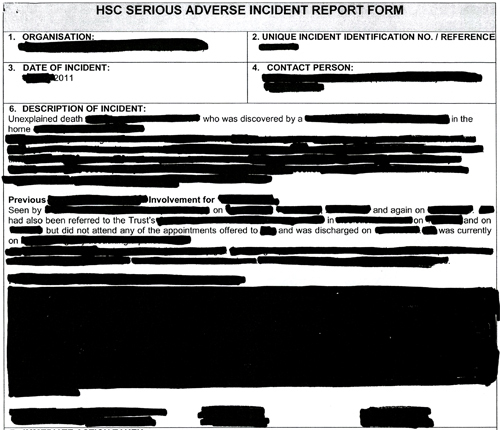 Information on SAI procedures issued by the HSCB in April 2010, states that SAIs should be reported to the HSCB within 72 hours of the incidents being discovered or in the case of unexpected/unexplained deaths which pose a significant risk to service users, staff or the public, within 24 hours where possible. Detailed reviews must be completed within 12 weeks. Specific dates were removed from the forms sent to us but in some cases the year the incident took place remained. Some took place in 2010. As all the forms sent to us involve incidents reported in 2011, this means the 2010 incidents either happened at the very end of 2010 or the incident form was filled in well past the 72 hour guideline. Example 1 above is typical of quite a number of the documents released to us. The person who died had been involved with services, failed to attend appointments and had been discharged. We do not know the cause of death but it may be suicide. There is no information to confirm that the coroner was informed. Example 2: this form appears to document the death of a patient sent home from hospital after investigations had taken place. At a later date staff discovered that something previously undertaken – which may be an x-ray or scan – showed something. However, this was not acted on in the ED (emergency department?) until a date removed from the report. By the time the family was contacted, the patient was dead. The coroner was informed about this incident. 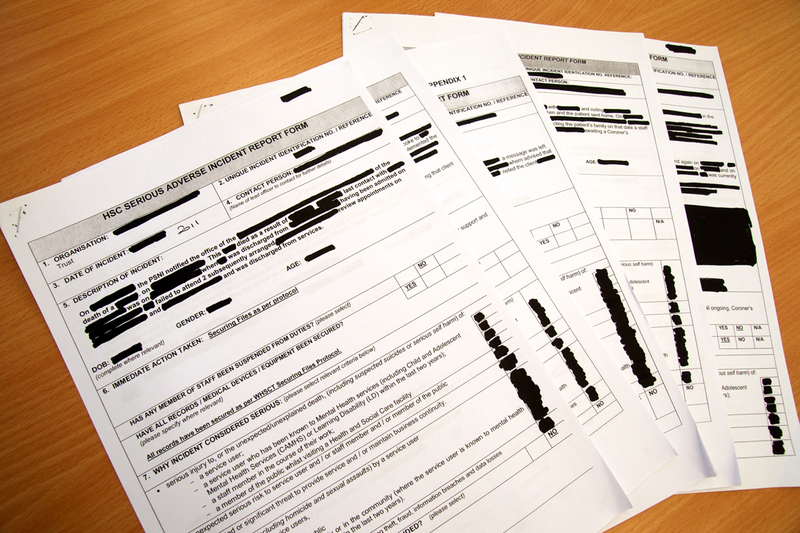 Example 3: this report shows the extent of some of the information removed from the forms before being sent to us. The person died from an “unexplained death” and had been receiving treatment but had been discharged after not attending appointments. The coroner’s office was informed. Example 4: this case involves a young person found in dead in bed. An autopsy did take place but the box asking for information on if and when the coroner was informed remains empty. Example 5: the form above covers the case of a “client” who took their own life. Again, the information box relating to the coroner being notified is empty. Example 6: this “client” attempted to contact a member of staff who was on leave. The day the call was returned, was the day the person was buried. Again, the cause of death has been concealed. The coroner was informed by the PSNI. The Department of Health provided us with a statistical breakdown of the 1,552 serious adverse incidents reported to it between January 1st 2005 and April 30th 2010 – after this date the reports had to be sent instead to the Health and Social Care Board. The SAI reports submitted to the department came from acute, community/social care and family practitioner service and included health trusts, boards and out of hours services. In 2005, 217 SAIs were reported, 252 in 2006, 324 in 2007, 397 in 2008, 287 in 2009 and 75 in 2010 up to the end of April. Two analysis reports were written for the periods July 2004-December 2005 and January 2006-March 2007. A third report is currently being completed for the remainder of the period up until transfer of responsibility to the HSC board. During the two periods covered by the completed analysis reports, almost a third of the reported incidents involved the death of a person – although this does not necessarily mean that the incident contributed to the cause of death. Of these deaths, two thirds were suspected suicides involving people in recent contact with social services. The Coroner’s Office spokeswoman said that any death must be reported to the coroner if it resulted, directly or indirectly, from any cause other than natural disease for which the deceased had been seen and treated within 28 days of death. This includes if a medical practitioner has reason to believe that the deceased died directly or indirectly as a result of violence, negligence, misconduct or malpractice; any apparent suicidal death, and in any circumstance that requires investigation. In a detailed statement, the spokeswoman said: “Not all serious adverse incidents result in death or serious harm. A death is reported to the coroner, and the coroner would expect the death to be reported, if it falls in to any of the categories detailed above under section 7 of the Coroners Act, and not simply because an adverse incident has taken place. “Therefore some deaths, where the adverse incident did not result in death, or did not contribute in any way to the death and the death was deemed to be due to natural causes would not have been reported. “A coroner investigates the circumstances of all sudden, unnatural or violent deaths. A coroner is an independent judicial officer. The coroner seeks to establish the cause of death and will make whatever inquiries are necessary to do this, obtaining witness statements and medical records or holding an inquest, independent of any other investigation. “As some of the cases referred to in this enquiry refer to cases up to July 2011 this may mean that the information about the SAI has been taken from Form HS1 which is completed at the time of the incident pending further investigation. A referral to the coroner therefore may have subsequently been made. We asked the Department of Health for a comment and also asked if it was concerned about the number of deaths which appear not to have been notified to the coroner. However, the response did not specifically address this key issue. A department spokesman said: "The timely and accurate reporting of serious adverse incidents has always been a matter of concern to the Department. Under previous arrangements, these incidents were reported directly to the Department, but they are now received and actioned by the Health & Social Care Board. “Patient and client safety and the need to learn and disseminate lessons when things go wrong are at the heart of the system. This is continuously being refined, and to that end the Public Health Agency is currently leading a project to devise a new regional adverse incident and learning system that will build on the good work of the last seven years. “The Department is concerned about serious adverse incidents which follow in cases where clients fail to attend appointments. While mental health services do urgently follow up clients who fail to attend appointments, the recently published National Confidential Inquiry into Suicide and Homicide (NCISH) report recommends further action that may be taken. Our concerns about the coroner being informed were passed to the HSCB. A spokesman said: "The board understands that the office of the coroner has clarified for The Detail aspects of the reporting and notification process that relate to serious adverse incidents. “As the initial report of an SAI can be made at a very early stage of an event or incident, not all information may be known at this point. RQIA is the independent body responsible for monitoring and inspecting the availability and quality of health and social care services in Northern Ireland. It also oversees adverse incidents occurring within the mental health and learning disability programmes of care. We asked for the authority’s view on the death of “clients” who fail to show up for appointments. He said: “RQIA is aware of this issue and the particular difficulties involved in engaging with this client group. In 2009 RQIA raised this issue with the DHSSPS, who in turn brought this matter to the attention of HSC trusts, highlighting the need to proactively and as a matter of urgency follow up missed appointments and those clients disengaging from services. The Northern Ireland Adverse Incident Centre (NIAIC) records and investigates reported adverse incidents involving medical devices, non-medical equipment, plant and building items used in Health and Personal Social Services in Northern Ireland. It also issues warning notices and guidance to help prevent recurrence and avert patient, staff, client or user injury. Its website says its work includes “encouraging a shift to a safety culture in the HPSS, where open reporting and balanced analysis are encouraged in principle and by example”.